There are no one-size-fits-all methods for people when they’re trying to get clean and sober from drugs or alcohol. While 12-step programs are a method that helps many people around the world, you may need something different. A quality treatment center understands that each person is different, and because of this, there must be different approaches. This is why a non 12 step drug rehab program might be the best option for you when getting clean and sober. One of the issues many people have with 12-step programs and other programs like Celebrate Recovery is the spirituality. While some people may be able to find a Higher Power of their understanding, for others, there are more beneficial options. SMART Recovery is a scientifically-based program that is one of the most popular alternatives to 12-step programs. With MET, you’ll work with therapists to discover self-motivation techniques that can help you stay clean for years to come. Another issue that some people come across in different 12-step groups is the lack of focus on mental health. One of the leading causes of addiction is when you’re struggling with an underlying mental illness like depression or anxiety. The problem with not addressing mental health issues is that it’s hard to stay clean when your symptoms arise. This is why it’s important to work with a licensed professional who can help with your mental health. For some people, dual diagnosis treatment may involve using different non-narcotic medications. These medications can include antidepressants, anti-anxiety medications as well as mood stabilizers. There are also those who turned to drugs and alcohol as a way to cope with a traumatic past. Working in a one-on-one setting with a therapist will give you an opportunity to open up and begin healing through your trauma. There are many different treatment methods, but ones that are proven by science have the best success rates. These are evidence-based treatment methods, which help to heal the brain and rewire different neuropathways. 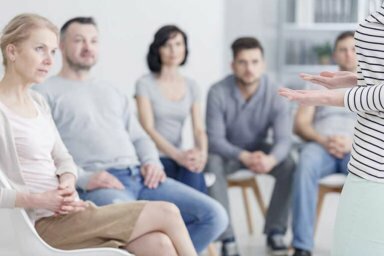 Some of the most common forms of evidence-based treatments include Cognitive Behavioral Therapy (CBT) and Dialectical Behavioral Therapy (DBT). Both of these methods help you begin identifying different external as well as internal triggers and finding new ways of coping. As you begin practicing these strategies in treatment, you’ll begin to see your cravings start to subside. To learn more about our non 12 step drug rehab program and how it can help you, reach out Morningside Recovery. Call us today at 855-416-8202 to let us help you start making better decisions, every day.